History and elegance are embodied in the Studebaker Mansion at Rye Ledge, New Hampshire's most pristine coastal landmark. 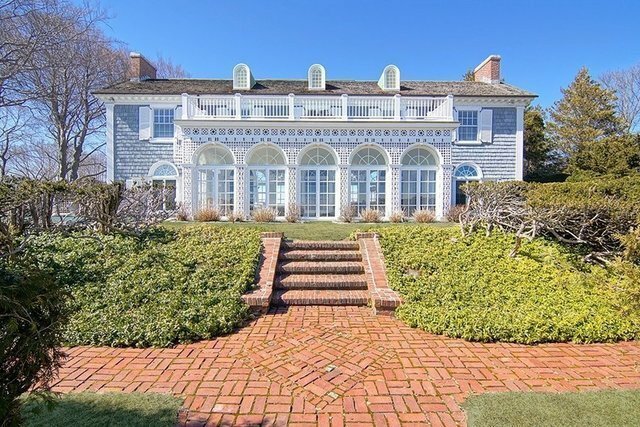 This is where auto executive Clement Studebaker, Jr., built his magnificent home (c.1917) on the rocky New England coast. This magnificent Italian Estate has been meticulously preserved, maintaining all historical detail in both the interior and exterior design, while at the same time furnishing the best of modern comforts. As you enter the 23' Reception Hall, enriched with original imported English brick, you are immediately transported through time and find yourself among those who summered on the Rye Beach coast in the early 1900's. Deliver your dinner jacket to the Cloak Room attendant and wander past the majestic winding staircase to the salon, where a string quartet plays soft background music to match the unparalleled views of the Atlantic Ocean beyond the Solarium. Of particular note in the Main Salon is the 7 by 7-foot fireplace on the west wall. Its magnificent marble mantlepiece was originally commissioned in 1907 and came to the Studebaker Estate directly from the Guggenheim. The fireplace and its surrounding elegance augment the antique custom-made bookcases placed in their own individual alcoves on either side of the French doors, providing a grand entrance to the Solarium which presents stunning 180-degree ocean views. You can almost hear the string quartet and tapping shoes of quests dancing in the moonlight bouncing off the crystal chandeliers as it shines through the Solarium's wall of oceanfront windows. The expansive Kitchen and its casual dining area anchor the house, designed for the gathering of friends and family around the massive granite island. The space contains the original cast iron stove in working order; the ample Butler's Pantry and Wet Bar; an office area; and is flanked by the Billiard Room on its west side and the Formal Dining Room on its east side.